President of the Republic of Azerbaijan Ilham Aliyev has viewed the conditions created as part of the construction of the second part of the seaside park-boulevard complex in Astara. 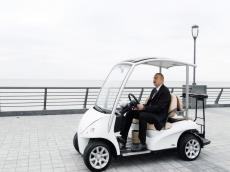 The president toured the territory of the complex in an electric car. The construction work on the expansion of the territory of the seaside park-boulevard complex in the city of Astara started in accordance with the decree of President Aliyev dated June 8, 2017. The construction work ended in August, 2018. The second part of the park-boulevard complex occupies an area of 10 hectares. The national flag flies on a 52m-high flagpole there. The complex features an equestrian center, kart racing track, outdoor fitness gym, bike lane, and amusement park for children.